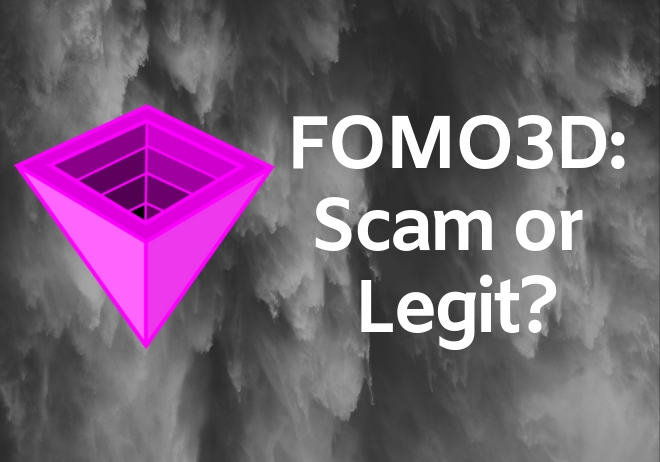 If you haven’t heard of FOMO3D (F3D) or POWH3D (P3D or Proof Of Weak Hands) yet the chances are that either you live under a rock or you are a casual retail investor like me. These Dapps (Decentralized apps) have caused a rift between crypto-enthusiasts in the know, with some calling them BitConnect 2.0 and others stating that they are simply misunderstood games. Either way, when there is money to be made, it’s usually followed by a large amount of hype. This hype stage is where we are now… The reason for the hype is the prize pool of ~21,702 ETH (at time of writing). Prompted by the hype around both Dapps, we decided to investigate and try to discover if this is really the next BitConnect waiting to exit scam or whether there’s more to it. During my research, I spoke to CryptoKnight (supporting dev and creator of the Wiki), Justo (Founder & Lead Dev), as well as some other people who’ve found success and failure. This will not be a quick read, but it will be detailed and hopefully informative. I hope you stick with it and read to the end, you might be surprised at what you learn. FOMO3D is a parody of the cryptocurrency space as a whole, namely the seeming requirement of all ICOs (initial coin offerings) to run off with large amounts of unaccountable cryptocurrency. Let’s start at the beginning, shall we? FOMO3D is the latest Dapp game to be released by the JUST team. At its core, it is a lottery game. You buy a key for a value in ETH and that ETH is added to the prize pool. If you are the last person to buy a key when the timer runs out, YOU WIN! Sounds simple, right? It is a little more complicated than that and we can go into that a little later in the article, but for now that should suffice. What is interesting to know is that the whole game is run by smart contracts, NOT by humans. The contract handles everything from the money coming in or out of the game, the timer, distribution of winning, and passive income to key holders. This means that there is no-one with the power to run off with your money. Hence no exit scam, even with the rather comedic domain name of exitscam.me. So, lets discuss the team a little. The team behind FOMO3D is continually growing, with members being hired from within the community. The core team consists of four members Justo (founder & lead developer), Mantso (lead developer), Inventor (Solidity programmer), and Sumpunk (Web developer). According to the wiki information, the four met on Discord and Justo added them to the core team as they became more and more involved. Other than that, very little is known about any of them. Referral bonuses – If you refer or ‘advise’ someone to join the game using a referral link, you receive 10% of anything they spend on the game as a dividend. Social media – On YouTube, if you search for FOMO3D, you are bombarded with 1000’s of videos; either shamelessly pushing their referral links or calling the game out as a scam (any PR is good PR, right?). All these elements come together and have contributed to making both F3D and P3D some of the most successful Dapps on the market. Whilst referrals are not uncommon throughout exchanges, ICOs, or other crypto related enterprises, it does feel somewhat Pyramid-scheme-like in this instance. On the other hand, how often have we spoken to friends and family about lotteries and other contests? Does it only feel scam-like because its crypto? Is this the next BitConnect waiting to happen? This is an interesting question. We can start by understanding BitConnect. BitConnect was a pyramid scheme and a lending platform, in which users invested their cryptocurrencies, which were quickly converted to the native token BCC, and users were paid interest on their investment. Well, that’s what should have happened. But after a short amount of time BitConnect suspended operations and disappeared with users funds. Another difference is that BitConnect was a lending platform in which users were promised interest on their investment. The focus of F3D (and POWH3D) is a lottery in which by increasing awareness and referring people to the game, liquidity is improved, price rises, and dividends are paid out. Only you can make the decision of whether you think it is shady or not. DYOR! Sure there’s elements of these games that seem a little off – anonymous team, MLM referral system, and an expectation that the code is trustworthy. There happens to be an article in circulation about a suspected exploit that is already being taken advantage of. (How to PWN FOMO3D) But what I find really interesting is a comment on the article by a user named “ProbablynotaRussian” where he claims the exploit was discovered by the team and given to the community to use at will. This means that you can interact with the code directly using Metamask for a chance at FREE ETH. (Gohan Mode) I even tried it out myself… no luck though. So, considering these points and their transparency about the exploit, they seem pretty legit to me. (Quick version only) Rounds begin with a short ICO phase, during which all players will be able to buy keys for the same average key price, determined by the total amount of ETH invested during this phase. Once the round begins, purchase one or more keys using ETH which immediately makes you the “private key owner” until another person takes the keys from you. Every key purchased updates the time on the countdown clock and very slightly increases the key price. Each time a new key is purchased, all key holders receive a portion of that sale proportionate to the number of keys held. You can recruit other participants to the game and will receive a 10% cut of every key they purchase, at no cost to them! The round officially ends when the countdown clock reaches zero. The last player to have purchased a key before the timer reaches zero becomes the winner. The last team selected by the winner before the timer runs out becomes the winning team. At the end of the round, the ETH active pot is distributed between several parties with the winner receiving half, and the rest of the players each receiving a share of the pot proportional to the number of keys they held. In addition, a percentage of the pot is paid to P3D holders as dividends. The specific split of the pot (who gets what) is determined by the team selected by the winner when purchasing their last key. (Long version only) Before a new round, there is a 1-hour grace period in which key purchases are disabled and any ETH sent to the contract is routed directly to your vault. Once the keys are sold and the pot has been fully distributed, a new scam (round) begins anew! Keep in mind that a portion of the pot is withheld to help kick off the next round. All the ETH you earn when a round ends as a winner or a player is then stored for you in “The Vault”. Referral rewards (“Bad advice”) are also stored in the vault. You can withdraw ETH from the vault anytime to your Metamask wallet. This table explains the breakdown of incoming ETH (money from the purchase of keys). For example, should you spend 10 ETH on keys and choose the Whale team, 50% or five of your ETH, would be added to the prize pool, 30% or three ETH, would be distributed amongst all F3D players, and 6% or 0.6 ETH, would be distributed amongst P3D players. This amounts to only 86% of the total balance, or 8.6 ETH. The remaining 14% or 1.4 ETH, is distributed as follows: 10% or 1 ETH to the player’s referrer (or all P3D players if no referral), 2% or 0.2 ETH to the community fund, 1% or 0.1 ETH to pot swap, and the remaining 1% or 0.1 ETH to the airdrop pot. As you can see, passive income is key! And this is even more relevant when you consider P3D takes a 10% cut of all buy/sell orders and distributes that amount to all P3D holders. I know it’s a little confusing but hopefully my explanation makes some sense. So, you can glean a lot about a project just by joining its social media channels: Telegram, Twitter, Discord. I decided to reach out to users on Discord to get some stories from average users. I wanted to get some success stories as well as contact users who aren’t as pleased with their experience. As you can imagine, unhappy users were a bit difficult to find on the official F3D channel. However, I did manage to connect with one displeased user who, for this article, will be called Smoking Man. Smoking Man, points out that censorship is rife within the Discord channel, with anyone discussing the benefits of other similar Dapps being insta-banned. While this isn’t unheard of, cryptocurrency is supposed to be about decentralization and transparency, so the moderators censoring public forums seems a bit hypocritical. Smoking Man did also say “I like P3D, I like the idea, I love all the new Dapps – I just think the reality is a lot further then is shown in Discord”. It was a lot easier to find people that had a positive experience. @Swizz, “I eventually dropped another 100 bucks or so in on the run up to 20k. and then the market hype died down. Even crashed…seeing the dividends disperse even when there was a selloff have me enough confidence to leave my money sit and I’m glad I did”. Another quote from @Swizz “I think anyone who enters this ecosystem needs a holding in P3D. I don’t think it’s too late because they are always thinking ahead of the next release. This dev team has been the group that puts out the contracts that get cloned”. I also spoke to @Matterhorn who suggested “Get a really good understanding of what you’re investing in before buying any of these tokens”. And that’s very sound advice for anyone interested in these Dapps. It’s interesting to note that I didn’t speak to anyone claiming actual realized profits over 10-20x. The people I spoke to have a very level-headed approach to the games and were far more interested in a long-term passive return. After all the research I’ve undertaken, I have concluded that while all the branding of these games screams pyramid/Ponzi scheme, that is all part of a clever marketing ploy, to gain attention from the media and generate hype. This is by no stretch of imagination a get rich quick scheme, it’s for extremely long-term investment with small yields, but those small yields could amount to large sums over time. “P3D was built as an experiment in a new type of token mostly as a serious joke, one that ironically broke cryptocurrency rules and allowed people to play cryptocurrency differently than they already have. Our games do not follow the rules in cryptocurrency they never will. Because crypto does not realize tokens can do anything, there are no rules. Too much of the space is copycats for that potential to be realized for example”. I will conclude this article by saying that I intend to do some more research on the Dapps, but I do have an interest in investing in P3D. However, I am NOT recommending that anyone else should do the same, simply telling you the decisions that I have made after investigating the project. I encourage anyone that has stuck with this article all the way through to do your own due diligence. Hopefully you’ve enjoyed this article somewhat and found it informative. Thanks, you for taking the time to read this article throughout.